We had crumpets in the house while Myron’s dad was here. Yesterday, I finished the last one. I knew they were going to be difficult things to photograph for you, but I wanted to try, in case you were like me and grew up without them. On the bottom, they look like a pancake, but they’re extremely yeasty—I imagine they’d taste great if they were made from a sourdough starter. On the top, they look like what would happen if you let a pancake cook too long. The surface is covered with holes, resilient ones. If you hold one in your hand, it feels a little flabby and oversmooth, and the bready smell of it will reach your nose and you will think there is no way that this is going to be a good idea. But then you toast it. A crumpet takes a good, long toasting. I put them in my toaster oven for eight minutes and they barely change color. The surface dries out a little bit and it loses that rubbery feeling. The bottom absorbs all that heat and still stays soft and pliable. The teeniest bit of the rim will maybe get a little crackly. I burn my fingers when I transfer it from the toaster oven to the plate. The smell in the kitchen becomes heavenly—it’s a whisper version of the soul-snuggling shout that is a home-baked loaf of bread. Quickly, I smear salted butter on it. It melts almost instantaneously and disappears. Inside a crumpet is a damn revelation. Every one of those little holes on the top surface reveals a tiny chasm that goes straight down to the base. “Nooks and crannies” will never cut it for me again. 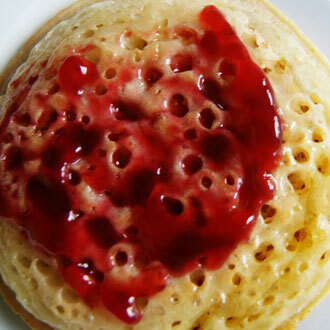 The holes in the crumb are glossy and the butter (or maple butter, or jam, or Heather’s lemon curd) shoots straight to the bottom, filling each one and melting it so that it disperses throughout the entire crumpet. Biting into one means that whatever you’ve spread on top explodes into your mouth, magnified by heat and pastry. It’s glorious. We can’t keep them in the house very often or we might not eat anything else. But for occasional treats, they are amazing. You might not be able to find them in your grocery store—I certainly never did in anywhere that I lived in the US—but Wolferman’s has them for mail order. Maybe you have company coming. Or maybe you can just look forward to a late weekend breakfast with someone who makes your toes curl. (Maybe that someone is you!) I think you should try them, at least once. And then you might never share them with anyone else.